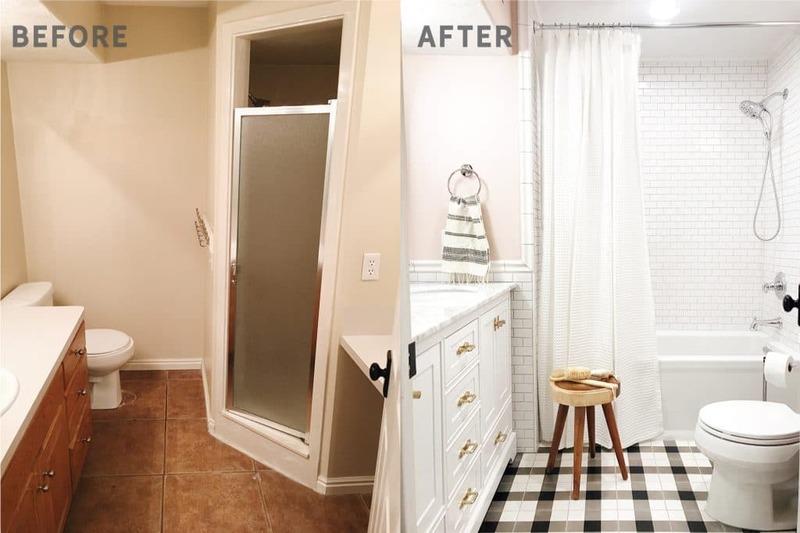 Before And After: The Girls’ Bathroom is finished! Here’s how the bathroom looks now! Besides updating the look of the bathroom, our goals also included adding a tub and a double sink in the small 8’x7′ bathroom. Victory! We kept the vanity where it was previously, but updated it to a new pretty one with a marble countertop and double sinks. Our girls love having their own sinks and mirrors and drawers. Though the vanity came with faucets and hardware, they weren’t quite what we had in mind. We swapped for these beautiful Delta brand faucets in chrome and the cabinet pulls and knobs in aged brass, matching the finish of the sconce we added between the mirrors. 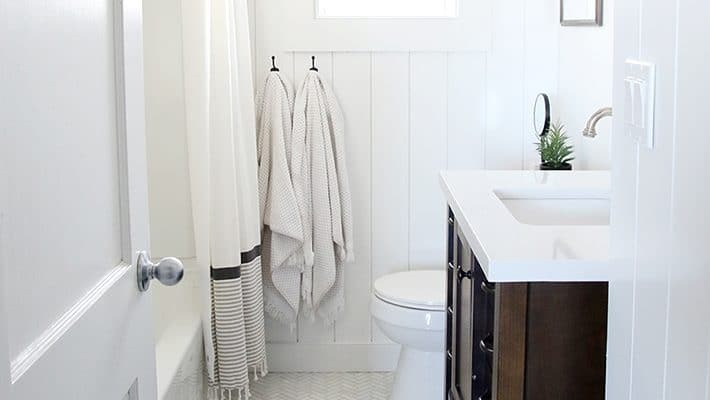 A towel ring and towel were added to each side of the vanity, along with a tray and some functional (but also pretty) necessities finished off this corner of the room. Splurge on the little things, I say. Moving the toilet over here really opened up the room and possibilities in the room. We were even able to squeeze in a small linen cabinet in the corner. 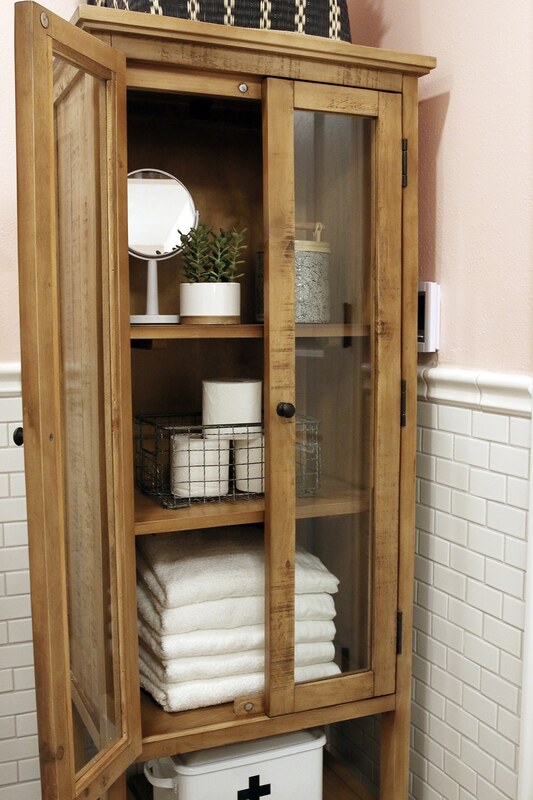 A simple over-the-door wooden hook for towels add function to even the back of the door–we squeezed it in in here! Swinging around the room a little more, brings us to the tub and shower–which changed this room entirely. If you’re going to have a tub and shower in a kids’ bathroom, installing a hand-held shower head will change your life! I didn’t know what we were missing. It’s been so nice to pop it out (this one from Delta is held by a strong magnet) and rinse off the girls easily. We also hung an extra-long shower curtain (84″) that really helped make the room feel taller and grander than it actually is–similar to how you should hang window treatments hight and wide. And I’m sure the built-in shower cubbies we added (three cheers for no shower caddies needed! ), will be lined with tiny rubber fish and shopkins in no time. Perhaps the often unspoken, but definitely noticeable difference is lighting. While the original bathroom had some old-school hollywood vanity lighting, it lacked any overhead lighting, always making the room feel dark and dingy. We added two recessed cans and sconces on both sides of the room so the whole tiny space feels brighter and bigger. Despite taking 7 months, the finished result feels worth every minute. 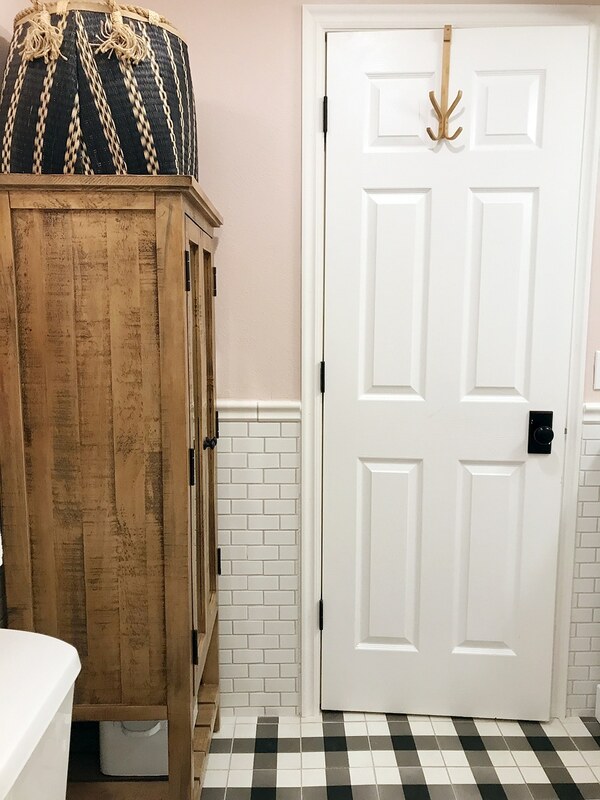 The project was not without hiccups–maybe we’ll save those for a different post–but with our first gut bathroom remodel under our belt, we’re ready to take a deep breath and dive into our next one. All sources listed below! (FINALLY) MAKING PROGRESS IN THE DOWNSTAIRS BATHROOM! BATHROOM RENO 101: THE TILE IS IN! Our 9 Big Project Before and Afters of 2016! 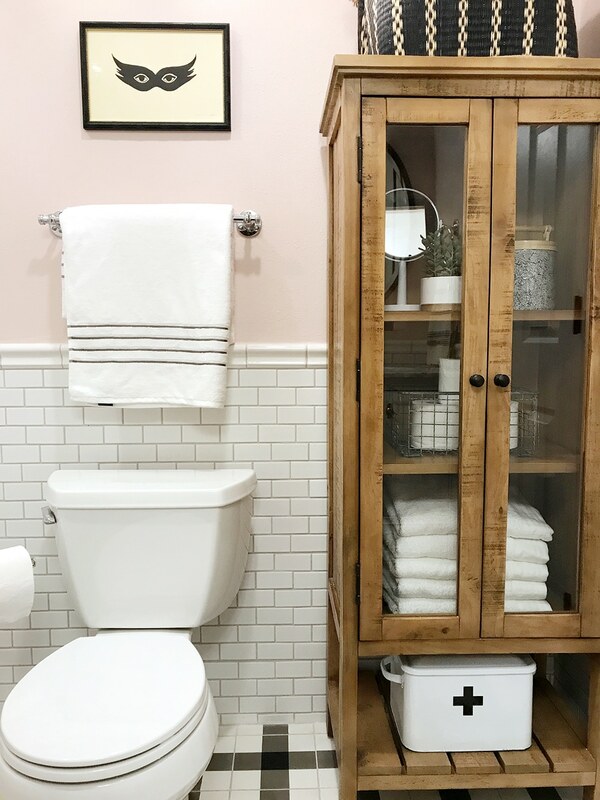 The Most DIY Friendly Bathroom Renovation We’ve Ever Done! Hi! The bathroom looks great. I’m planning a bathroom Reno right now and and getting a combined shower and bath as well. I’m just was wondering if you have an opinion on the pros and cons of having a glass partition vs a shower curtain. A shower curtain is a little easier on the maintenance but will take up more visual space. I am considering those same cement tiles from Cle. How have they held up? I would be putting them in a kids bath shared by 3 boys. Cement tiles aren’t as easy as ceramic, per se. Ours have held up pretty well but they make so many look-a-likes now, I might go in that direction for durability sake. This is beautiful! Wondering about the durability/quality of the Wayfair vanity. Has it held up? Considering using them in an upcoming master bath reno and curious about the quality. They have a great selection. So far, so good! No issues at all. Hi, I was wondering if you could post what light bulbs you used in the Schoolhouse sconce? I’d really appreciate it! Thanks so much! I believe they came with the sconces. This is simply gorgeous! I love all the little gold touches. And that basket above the cabinet is everything. Nicely done. What did you use to cover the space between the ceiling and shower wall tiles? I am redoing our bathroom myself and have the same space yall did in the previous post that the tile was in. Is it just corner round or some sort of tile? It’s vinyl/waterproof quarter round, yes. Hi Julia, The tile in this space inspired me to look at Cle Tile for my upcoming Laundry Room project. I got all setup with my order and found out that shipping was $200 at checkout! Just wondering if there was anything you were able to work out with them on a more reasonable shipping price. My laundry room isn’t huge at all, I suspect it’s the same as this bathroom, and $200 for shipping seems really high. Love you blog and miss your podcast. Thanks! Unfortunately that’s often just part of tile shopping online. There are better prices because of low overhead, but shipping is where it picks up. But sometimes you can find shipping coupons or even sending them a message and asking can help. I absolutely love this bathroom! Could you share what tub you got for this bathroom? Should be linked in the sources! 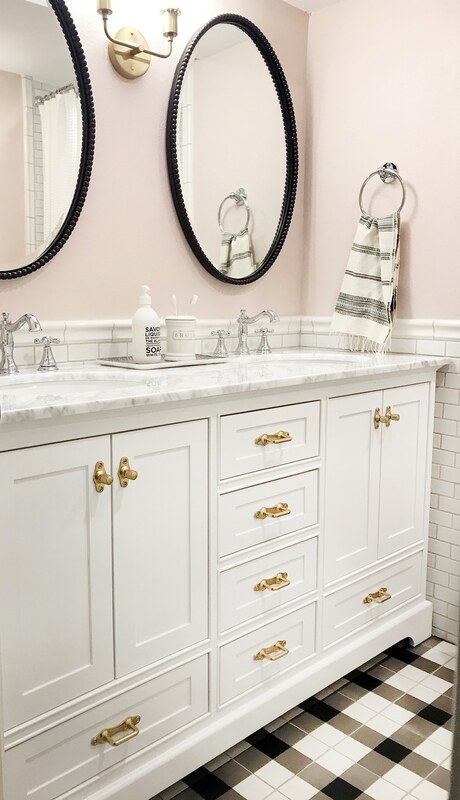 Will you share which vanity this is from Wayfair? It should be linked in the sources at the bottom of the post! Sorry, I can’t remember the exact name. Ah it was! Thanks so much! Did the backsplash come separate from the countertop? I like how you’re looks with your own subway tile instead of the backsplash that seems to come with it. The backsplash comes separate, yes. What do you use to clean the cement tiles in the girls bathroom? I typically use vinegar diluted with water to clean my porcelain tiles but would vinegar be too acidic for cement tiles? Considering using cement in next bathroom remodel, thx! They are sealed, so it should be fine! 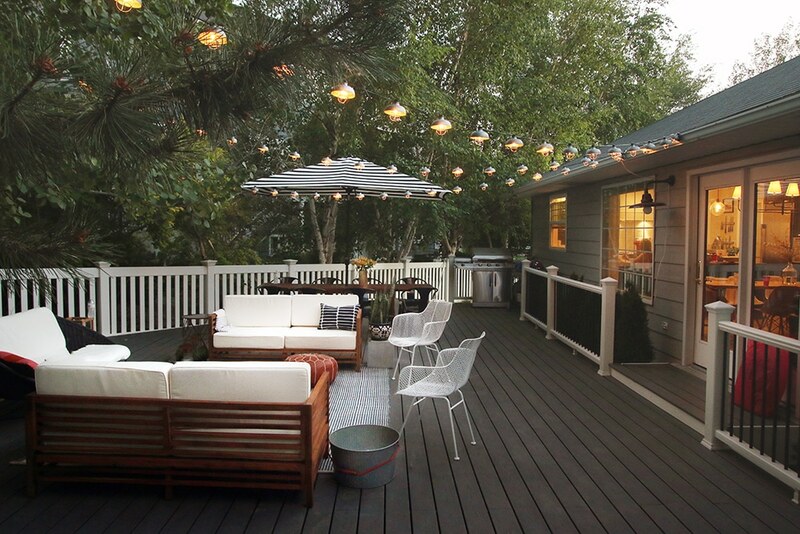 Beautiful renovation. We are in the middle of our own right now. I would like to know how the marble counter top is holding up with kids? I have three boys under 10 that will be using our bathroom and I am wondering if you are getting rings or water stains on the counter top? Beautifully done as usual!! Did you use same grout for floor and wall tiles? Did you end up putting in heated floors in the girls bathroom? Any info available on that? Thanks! there’s detail on that in this post! I am obsessed with the tile in this bathroom. I went to your source and realized that sadly it’s out of my price range. Did you find any similar tile that was in a lower price point or do you have any ideas on how to replicate that look using cheaper tile? Thank you! 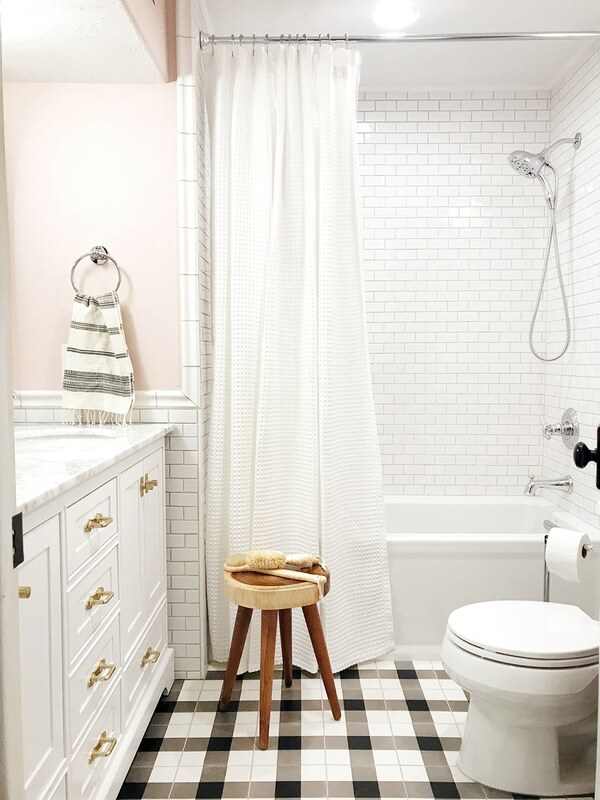 You could always get small 4×4 tiles in black, white and gray and make this pattern! Why are there drawers at the bottom of the vanity? I’m assuming there’s a utility to them that I can’t think of? Fantastic job on this bathroom! I remember you talking about this on one of your instagram stories (which I love, btw) but I can remember the name of it…did you guys use something for the vanity light to make it perfectly symmetrical? I want to say it was some kind of junction box…am I talking crazy here? Ever since you pointed that out in the instagram story, I’ve noticed every single bathroom vanity light is off center in my house. Help! You’re the best! Thank you! Keep up the great work! you IG-storied Chris centering the light between the mirrors with a recessed junction box. currently dealing with a box that is not centered and trying desperately to find what you used to solve the problem. would you mind posting how you fixed that issue? It’s called a pancake box. They can sit right on a stud. Curious, what light bulbs do you recommend in a bathroom without windows? Wow! Wow! This is so impressive! What a great job, the before & afters are amazing! So talented, thanks for sharing your ideas and experise! Can’t wait to start my own renos! Love the finished look! Where did you get the basket you put extra toilet paper in from? This is truly so beautiful! I wonder what went into changing the plumbing fixtures (moving the toilet, etc.) How much did a plumber charge for this? Is it worth doing for the cost? We live in a track home and the bathroom was not designed well. I’d love to gut it but have no idea what the costs/work associated are. Any input helps. Thank you and you guys did amazing on this project!!! Can I ask how wide your vanity is? We are about to dive into a bath remodel of our own and I am debating between one mirror or two and lighting is up in the air. It’s a 72″ wide space currently lined from wall to wall with a double sink vanity. This is beautiful! Congratulations! It’s hard to see the details but can you please tell me what you did where the tile meets the ceiling? Is that just caulk (your favorite word!) or is there some kind of trim? I’m totally obsessed with your tile floors! They are so classic and trendy at the same time! Great job on the reno! 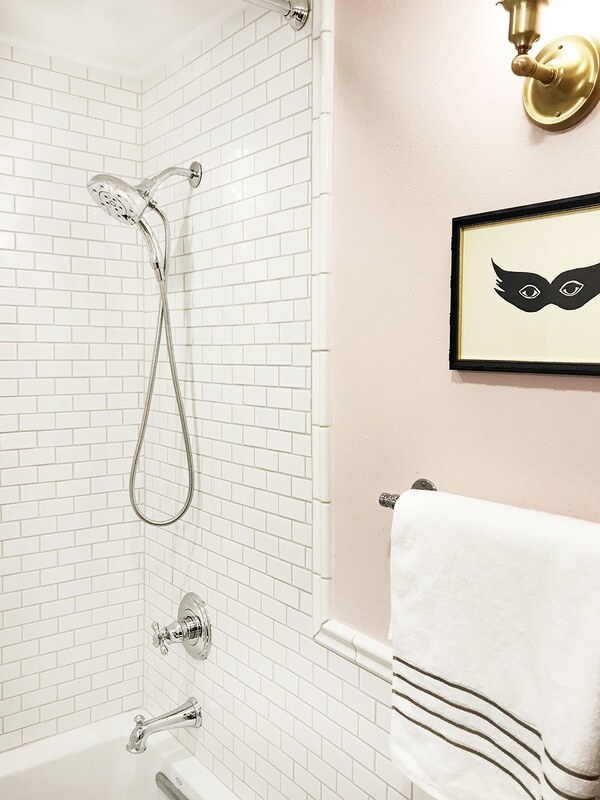 Crazy question…I want to switch out our stationary shower head for a wand type, but I love the two in one look! Does water still flow from the stationary part when the wand is detached? This is a beautiful transformation! 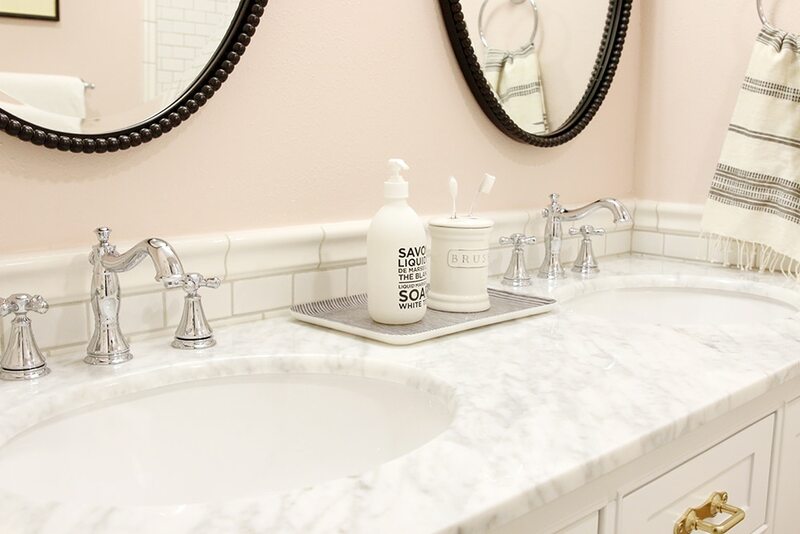 The marble vanity looks great. It’s gorgeous! I’m wondering if y’all have formula or a rule of thumb that you go by to determine lighting choices. We’re about to remodel a bathroom for our three boys (also for overnight guests) that appears similar in size to yours and same shape as well. Long, narrow. It has a big skylight which is great natural light. It takes up a lot of the ceiling, so we don’t have room for cans. We’re replacing the long, frameless mirror (I call it the College Apartment Mirror) with two mirrors similar to yours. My concern is that we have a four bulb light fixture now and we’d love to replace it with a two bulb, single fixture, just like you have done. How do you decide between one fixture with multiple bulbs in between the mirror versus a fixture above each mirror? I’m stumped. 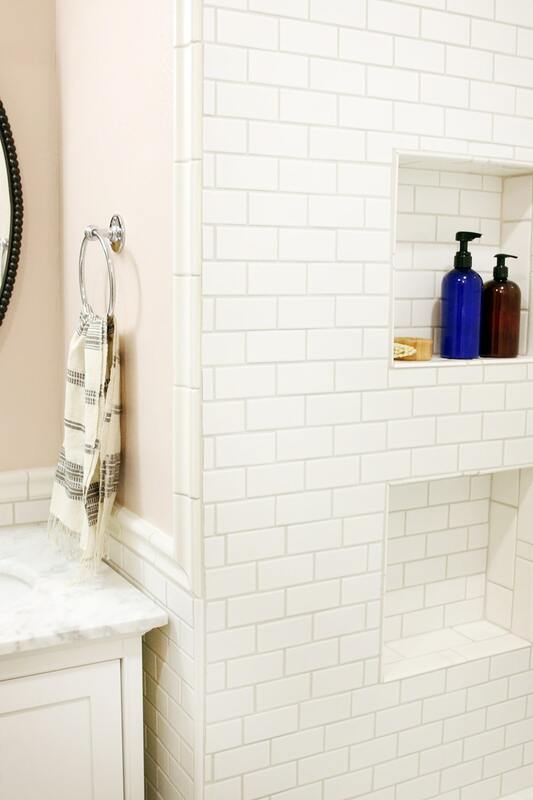 What was the ultimate cost for redoing the bathroom? Had you hired it out, what was the likely cost? We’ll try to tally that up for you. Everything looks great–nice work! 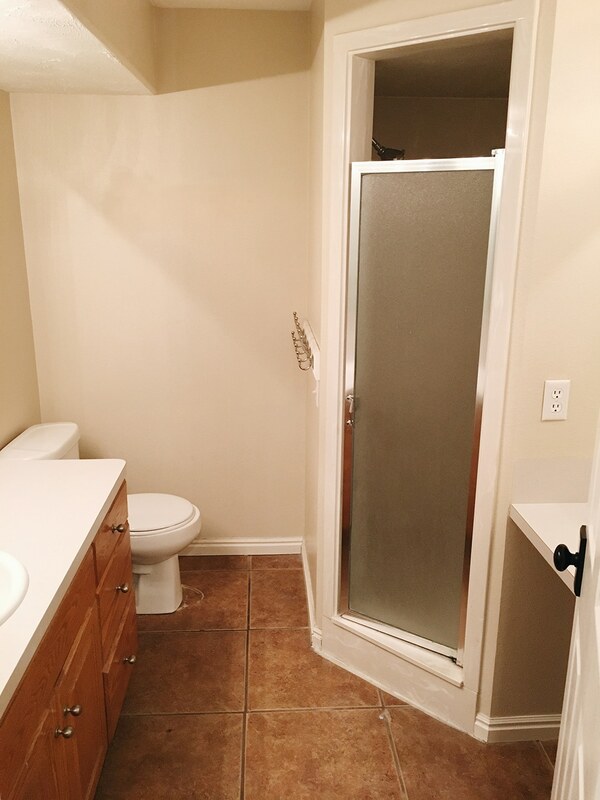 :) I have a silly question: is that considered one shower door, or did you order two? I’m not sure what you are referring to. The curtain maybe? We ordered one shower curtain and a liner. Ha–sorry to be unclear. I looked at the link to the shower door, and did you order one of those, or two of those? I love this bathroom! I love the long shower curtain choice, I remember your mood board had a patterned one from UO, but this one works better. I also have chrome faucets throughout our bathroom and thought I couldn’t use brass knobs, but now I see it can work. Okayyyy.. you just made me order that Studio McGee basket! Ah-Mazzini! It’s hard to pass up! I would love to know about the process of switching from one set of water lines to two for the new vanity. Is that something that would require a professional plumber or some basic diy skills? We have 4 kids sharing one sink (!!!) and I dream about giving them two sinks—no more spitting toothpaste on each other—ha! We had a plumber come split the lines for us. Hi! Such a pretty space for your girls. Kind of random but I’m doing a remodel as well. What kind of toilet is that? It’s a Kohler we got from Lowe’s. It’s on the shorter side for little ones. We remodeled our girls bathroom this summer as well. Feels so good when I walk in there now. Love your floors. I also went with a patterned tile for the floor. Was wondering what paint color you used. Thank you! The paint color is calamine. What brand of paint is it?? The light above the tub is actually an exhaust fan, too! Can you source the vent/light? It looks so simple and beautiful. Thanks! Looks incredible. Great job! Can you speak to your decision to use a toilet paper stand vs. a wall-installed holder. Did you not want to break the tile? Seems like it might get in the way during bath time for your girls, but perhaps you can move it to the other side of the toilet. Also, can you please link the black door handle & hinges? Love the bathroom! I didn’t know about the pink but it’s 100% perfect, subtle, and chic! love the linen cabinet! Where did you get that? It looks wonderful as well as useful and practical. I definitely appreciate the photos comparing the exact same areas. They make it so much easier to follow the total plan. Amazing!!! So well done you guys. I’m so impressed you were able to do this in the midst of pregnancy and newborn life!! My husband and I are needing to remodel both of our bathrooms thanks to Harvey, so we will absolutely be using this for inspiration (per usual) when the time comes and budget allows. Thank y’all so much for being awesome! Love everything you do. I cannot think of a sweeter space for your girls to use! 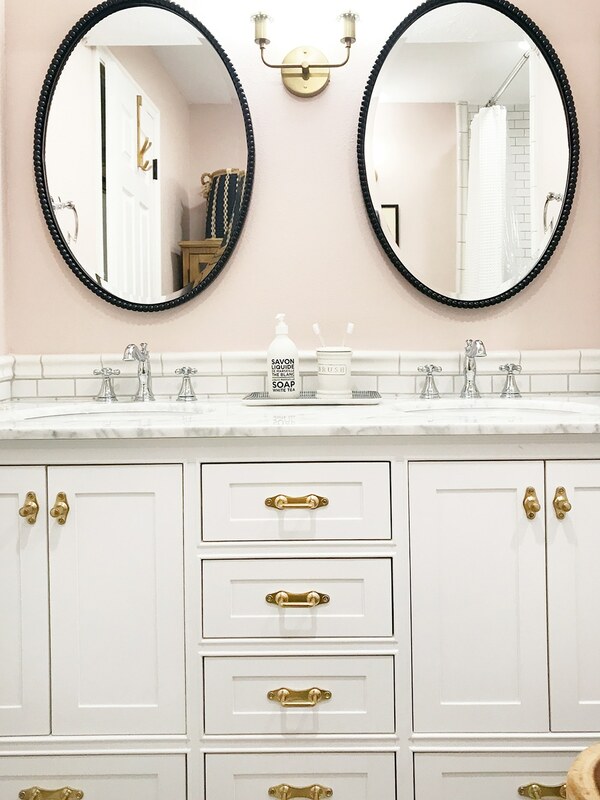 Those pink walls – paired with the floors and tile and cabinet and mirror ;) – are everything. Wow! It’s truly beautiful! 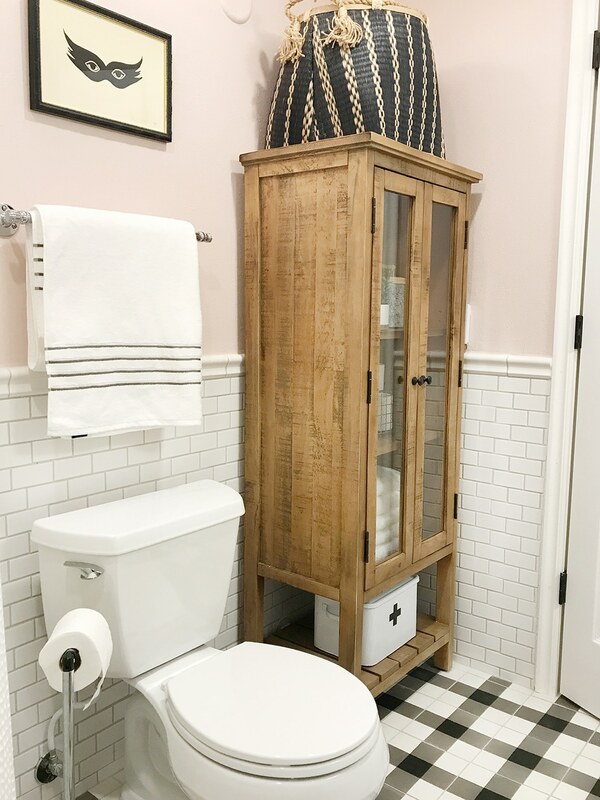 I love seeing pieces like the gingham tile and the more rustic linen closet that I wouldn’t normally be drawn to used in a more modern way. I’m getting ready to design 4 bathrooms in a home we’re building and feel completely overwhelmed! There are so many beautiful options out there. May I ask about your door knobs? What brand and finish are they? I’ve been searching for an affordable matte black with a rectangular back plate. Thanks! These are from Amazon. They say oil rubbed bronze but they are straight black. Good luck in your renos. Try to enjoy it! This bathroom turned out awesome! I love that it’s classic but still has a slight girly touch with the pink and such a sophisticated look! So many times people think kids = primary colors. Don’t feel bad about the 7 month timeline either. I mean, you had a baby! We are on month 5 of our master reno and I think we will be around 7 when we are finally done too 😉 Can’t wait to see what you have in store for your bathroom! I love how you took the tile all the way to the ceiling. Unfortunately in so many builder basic houses (mine included) they don’t do that. For a long time I’ve wanted to put in tall shower curtains like this but wonder if it would work since it’s on the wall and not tile. What do you think? We have same. Why couldn’t they just take the tile all the way up!? We have our shower curtain rod (similar to theirs-tension style) on the drywall and it’s been fine. 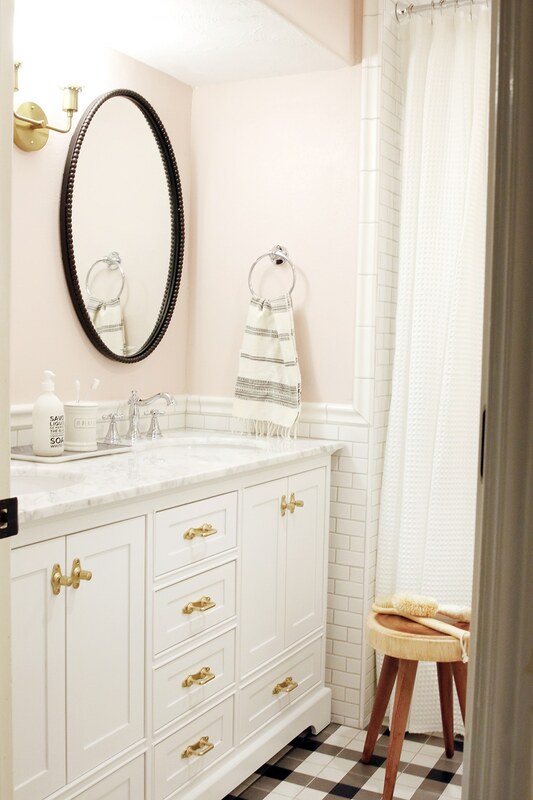 I love this bathroom, you did a wonderful job putting all of the finishes together! 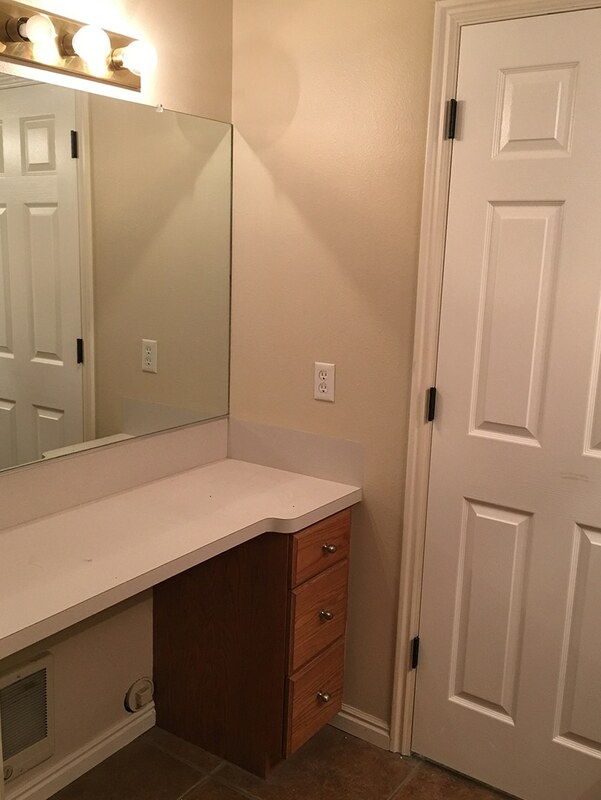 We actually got the same vanity back in January for our own bathroom remodel and love it, and the price cant be beat! I actually might use the same mirrors you ended up using, they look great with the vanity. Just wondering why you didn’t use the faucets which came with the vanity, they look identical to the delta ones! Looks amazing!! How do you take such well-lit photos of a room with no natural light? Every time I try, the photos look yellow or distorted when I try to brighten them after the fact. We’re getting ready to list our home and I’ll be taking the photos myself. Would love to hear your tips! It’s all about the amount of lighting and the color of the bulbs. We use 3000k bulbs in the recessed lighting we added and it’s a nice clean white. A little white balance helps too! Wallpaper is a lot less permanent than tile, haha, go for it! I love the look. I know you just finished this but I’m wondering how you like the delta shower head? I’m considering the same one for our master bath but have read pretty poor reviews on the water pressure. Have you guys had any issues? Do you like it? Thanks! We like it so much. Maybe the only downfall is the magnet is so strong, it really takes some oomph to get it down, but that’s not really a total negative. What is the source for the bathtub? I am in the midst of planning our reno for our only bathroom, but it is a big bathroom. We currently still have the tiny, 1960 iron tub in there. I dream of doing a longer, deeper tub (no jets), but get so overwhelmed with figuring out what we should do. Would love to know the brand and size of yours. Such a beautiful, sweet bathroom. I’m sure your girls love it :) Well worth the 7 months it took to complete. It definitely seems bigger and brighter now. Awesome job!!! 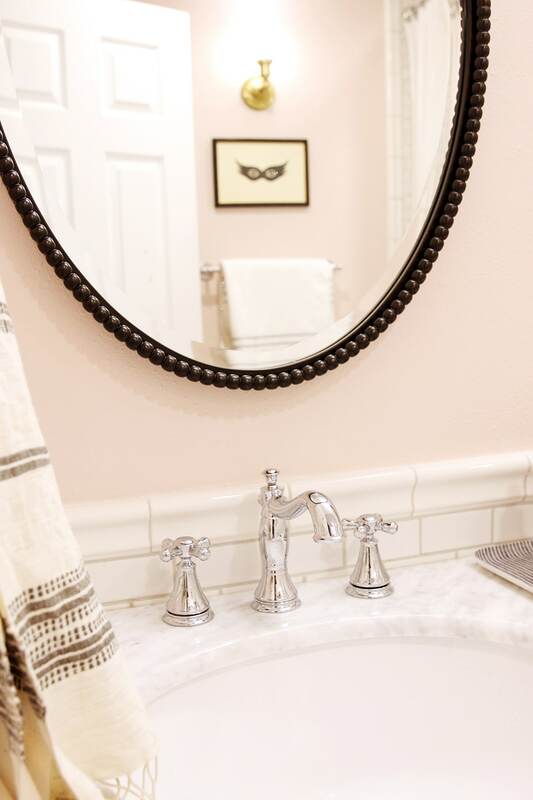 Love every last thing you did…except, I would love to know why you didn’t (or why someone would) paint the strip above the vanity pink instead of the somewhat choppy look of pink wall, white ceiling (soffit? ), pink wall to the real white ceiling. I would, I think, paint the soffit area pink. But I don’t know why other than to make it not stand out so much. Is there a better reason to do it? I realize there must be great reasons for not doing it and am just very curious. Thanks! The only reason we didn’t is because it is very clearly textured like our ceilings. agree with Julia about texture and also even if it wasn’t textured—I learned from a painter long ago that walls are walls and ceilings are ceilings (verticals and horizontals) and in ‘most’ cases, try to keep it that way. 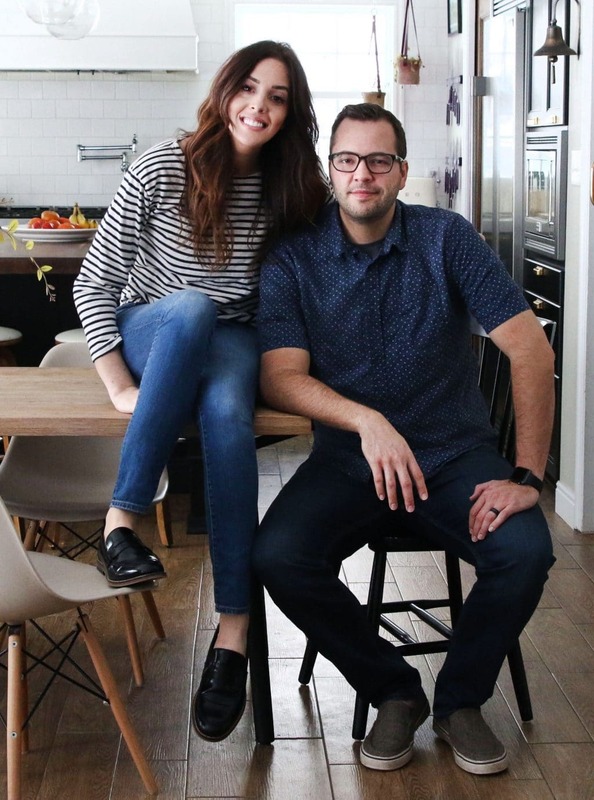 Sometimes changing the rule can give a room a more modern edge than you had intended, and your eye and brain are like “that looks weird.” We had a lot of soffits in our basement and followed the rule and it looks great. That makes total sense! Thank you! Beautiful! May I ask where you got the shower curtain? Wow. Wow wow wow. What a difference! Y’all did a MARVELOUS job on this. It looks great! I really like the black and pink combo. Now I wish I had girls so I can try it out, my boys will never go for it. This is really lovely! Beautiful Job, dream bathroom! I love the way you bring in the warmth with tiny details and touches. The bathroom turned out so beautifully! I love every bit of it, and am inspired for my own guest bath! To the left of the tub is a wall that wasn’t there before; are you using that enclosed corner (where the toilet used to be) for an adjacent room or closet? I saw that you added the shower cubbies on that side, but they don’t seem deep enough to use all that walled off corner space! Nope! It serves the shower niches, the hand towels, but also as a stop point for the shower/tub and the vanity. By adding it in, it actually opened up a lot of options, making the small room a lot more functional. On the other side of the bathroom is a closet. 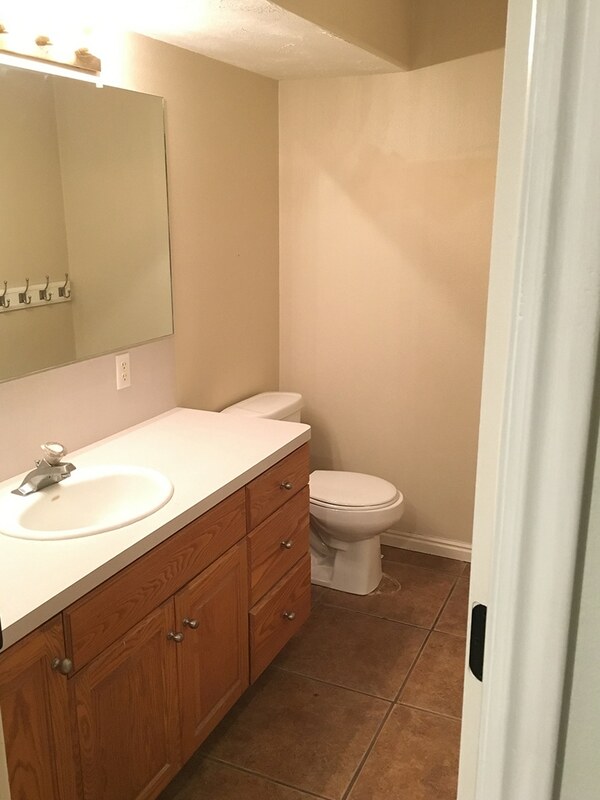 What is the cover painted next to the sconce on the wall with the toilet? I have one in my house and have never figured out what it is! It’s a junction box that we pulled wires from for the new sconce, unfortunately the wiring in the wall didn’t leave us much play so we had to cap it and run new wires over to the new location. Gorgeous…I’m in the middle of remodeling my kids bath and have used almost everything you’ve posted minus the tile…thanks for all of the ideas! Love your blog! Where’d you get the succulent with the white/gold base? I just got it at Target this week! Looks great! What happened to the pretty pink shower curtain you were going to use? When we painted the walls pink, we decided against it. I actually still have it! Gorgeous room! PLEASE come do my bathroom next! (we have only one full bathroom in our house for all 4 of us, with 2 pre-teen girls). What an update! I love all the subway tile and the vanity. Great eyes for how to realign this space. What a transformation! I can’t get over how much bigger it looks! Love the look of the warm wood of the linen cabinet against the pale pink walls. You guys seriously killed it on this one! 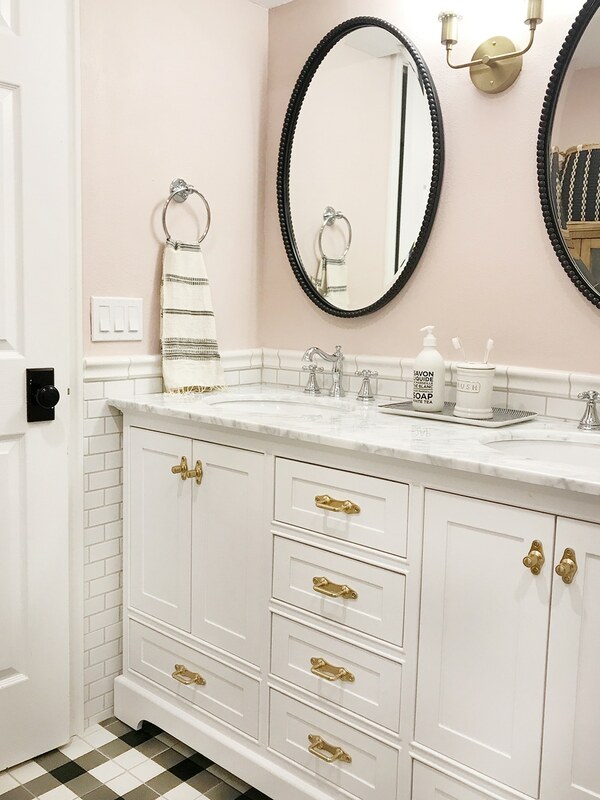 The tile, the mixed metals, and that vanity – wow. It’s hard to believe that the before and afters are the same room. Thanks for the continued inspiration! Wow, it looks great, and I LOVE the floor tile! One question I just thought of, that I may have missed in the previous posts… what’s going on in the corner you built out to enclose the tub? Is it just dead space, or is it a closet accessible from another room? Just wondering the SAME thing!! The shower niches are there, but besides that, I guess you could say, it’s dead space. But we added so much functionality to the rest of the room, we like to think of it as more necessary than dead. Blocking off that corner really allowed us to do so much more. It looks SO GOOD! Congrats on finishing!! Weirdest question probably but what color bulbs are you using? The standard 2700k ones? My windowless bathroom just looks so yellow with those! We like 3000k for the recessed lights and the sconces came with low wattage bulbs that don’t blind you and I think they are 2700k. Beautiful!!! Could you please tell me where you got the oil rubbed door knob? Thank you! Really love how it turned out! How you mixed finishes keeps it from feeling stuffy or too precious. How did it go, moving the toilet?? That’s always the big obstacle when doing a bathroom remodel, isn’t it. I’d love to know if it was an issue, challenge, or what. Thanks and congrats!